The Flash user administration helps you manage which employees are allowed to have access to the Flash system data. The Flash system data supplies protel Air with the hotel's fundamental data (e.g., rooms, rates, items, etc.). In the further course of development, the Flash system data will be eventually implemented into HTML5 client. Until the end of this implementation phase, you will be managing your protel Air system data mainly in Flash-Client. When creating a new HTML5 user, the corresponding Flash user is automatically created. The Flash user is needed to control your employee's access to certain system data areas. For security reasons, newly created Flash users DO NOT have access to the Flash system data. Therefore, if the user is to have access to the system data, you have to assign the relevant user rights. To do so, log into protel Air as an administrator and open the user administration (System data > System > User management (Flash)). Then assign the desired rights to the user. Determine which users are going to get access going to a certain system data area, and which users are going to be denied access. In the left side, select a user which you would like to edit. In the same manner, open the Options file and then the System Data file. 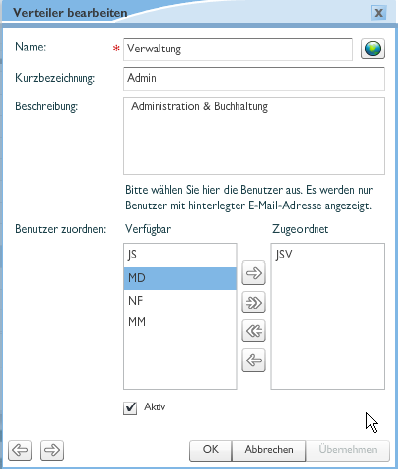 By means of the System Data folder, you can manage to which system data areas a user is to have access. If the checkbox in front of the name has been selected, the user has access to that area. If you remove that check, the user will have NO ACCESS to that area. If a user is to have access to the entire Flash system data, put a checkmark in the system data folder. Exclusively set up the privileges for each user. All other privileges that you can suspend in the Flash User Administration, are IRRELEVANT for working in the HTML5 client! With protel Air you can define a set of lists and reports which are then automatically sent to an individual user or an entire mailing list during the end of day procedure. The management of the mailing list occurs in the user administration under the Distributor tab. Name / Short description / Description: Enter a meaningful name for the distributor. Entering a short description or a description are optional. Allotting users: Allot a user that is to be a member of the mailing list. NOTE! Only users which have a valid email address will be displayed!